Every woman needs a red dress. This is a truth universally acknowledged–or, at least, it should be. Personally I believe every woman may only need one, but it’s best to have three: one cocktail dress, one casual day dress, and another that’s somewhere in between, simple enough to be dressed up for evening or down for day. I own a sarong wiggle dress in red for evening, a red sailor style dress for day, but somehow I’ve never quite found my in-between. Ah, until now. I recently discovered that Tatyanna.co.uk is beginning a sale today, Friday 14th November, which is awesome because this is a site that stocks a lot of my favourite high quality reproduction brands, and of course who doesn’t love a sale? One of the items that is in said sale is a dress I have now fallen in love with: the red Milan dress by Heart of Haute. This dress is sleeveless deep V-neck swing dress, fitted at the waist and coming with it’s own matching fabric covered belt. As I’m a UK 14 Tatyanna.co.uk sent me the size L, and it fits perfectly. I really feel it accentuates my waist well, something not all dresses do and thus require some additional attention of an extra good belt to cinch me in, but the Milan fits me well enough I can leave the belt off if I wish. Another surprising thing is that I, of the petticoat addiction, actually like the way this dress hangs on me even without a petticoat–shocking, truly, as I never leave off my pettiskirt. This is especially good to know for summers that are too hot for extra layers, and for when I want to make this casual enough that a petticoat would nix that intention. It still looks fabulous with a petticoat, of course, and that’s how I photographed it for you, to show it at it’s full glory as per my usual style. I really love how classic and elegant this cut and neckline is, something that will flatter so many different women. It’ll be easy to add a cardigan or shrug in winter to gain a little extra warmth when it’s nippy, but in summer I can easily imagine adding a pair of cute flats, cats eye sunglasses and red lipstick to dash out the door looking super glamorous with so very little effort. Any dress that can achieve that is a dress worth hanging in your closet. Tatyanna.co.uk also stock this dress in the Lake blue colourway, which will also be in their sale alongside other items. Hop on over today to snap up this true classic before everyone else beats you to it. Do you have a red dress (or three)? What items have you got your hopes up that you’ll be finding in an upcoming sale? 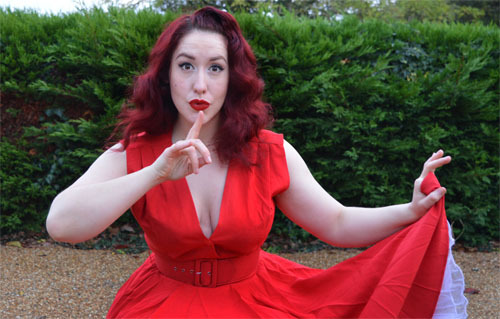 This entry was posted in Clothing Reviews and tagged 50s, fashion blogger, heart of haute, pinup, pinup blogger, red dress, retro, style, style blogger, tatyanna, tatyanna.co.uk, vintage style, Zoe vine by missamymay. Bookmark the permalink. I like the way you think, lady! Lol. I’m surprised I don’t own a dozen red dresses because I absolutely love them. Thank you doll! I definitely agree; you can never have to many red dresses, the same with black. They’re just classic. You’re such a knock-out in this dress, lady!! Unique Vintage just sent me a gorgeous red dress that I can’t wait to wear, but I don’t think I really have a casual red dress. Red is a good color on most people, so I should make an effort to add more of it to my wardrobe!